Mammoet has unveiled a new self-propelled modular widening adaptor that reduces the need for additional side-by-side SPMTs. The system makes it possible to increase the track width of a split SPMT, thereby increasing the width of the loading platform without the need for additional SPMTs. High and wide loads with a high centre-of-gravity – such as large pipe rack modules – are typically transported on multiple rows of SPMTs to ensure stability through the wider loading platform. 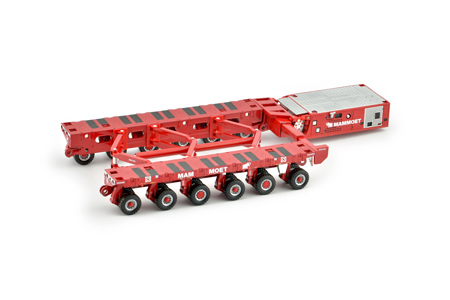 However, as the increased load capacity that comes with the additional trailer units is often not required, Mammoet decided to design a widening adaptor that allows for variable spacing of split SPMT trailers. Heavy transport manufacturer Scheuerle engineered and fabricated the new variant, which consists of an SPMT split down the middle with double sets of articulated arms attached to the inner walls of the two halves. The new split SPMT has a minimum width of three meters and a maximum width of 6.4m – meaning one row of split SPMTs can replace two rows of conventional SPMTs. In addition, by removing the widening mechanism and placing it on top of the two reconnected SPMT-halves, the width is reduced to 2.43m, which makes it possible to fit the split SPMT into a standard, flat-rack shipping container.